Sushi University isn’t just eating delicious sushi. Each excursion includes a skilled interpreter who accompanies you from start to finish, allowing you to experience the culture and history of sushi as well as learn about seasonal toppings the chef’s specialties and style of the restaurant. It is also a unique opportunity to ask any questions that come to mind during your experience, all in Tokyo, the birthplace of Edo-style sushi. The other day I had a very interesting guest at Sushi University from America. I’d like to introduce them to you. It was their first time in Japan and they stayed in Tokyo for a week. They planned to see Asakusa, the Shibuya scramble crossing, Meiji Shrine, the robot restaurant and all the other usual tourist sites. However, the conversation all seemed to be focused on food. I asked what they planned to eat. They answered that they would be going to restaurants like Tsunahachi (Tempura), Japanese Soba Noodles Tsuta (the first ramen restaurant in the world to be awarded a Michelin star), and Steakhouse Sato. They had already lined up early in the morning at the Sugamo ramen restaurant, Tsuta, to collect a numbered ticket apparently. The thing that surprised me most is that they were going to Sukiyabashi Jiro the day after their Sushi University experience. 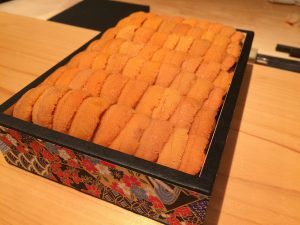 If you are visiting Japan, I hope that you too will come to Sushi University before going to an expensive Michelin Star restaurant, so you can learn a bit about Edo style sushi. The reason is that sushi masters are just humans who want to provide something delicious to customers who will understand their sushi. For example, just slightly different parts of tuna have a totally different tastes. In order to understand these kinds of details for your chef, you need to have some knowledge of sushi toppings and Edomae-style sushi. If you like sushi, you can’t continue to only judge the toppings on freshness and the fat content. Even if you don’t speak Japanese, with repetition, I hope you will reach a level that you can meet the challenges set forth by the sushi chef (understanding the Edomae-style techniques that have gone into each piece). On the other hand, there is nothing wrong with a special trip to visit a restaurant with a Michelin star as part of your vacation so you can boast about it with your friends. I have also visited Paris’s Guy Savoy and Florence’s Enoteca Pinchiorri, and treasure those memories myself. Returning the conversation to the American guest, they did already have impressive knowledge about sushi. Even their sushi chef was impressed at their knowledge. They had also done their own research and were talking about Ginza’s Sawada (two Michelin stars) and SUSHI BAR YASUDA. On top of that, they had come to Sushi University to test their skills and took that knowledge to Sukiyabashi Jiro. In the major American cities, there are a wide range of omakase sushi courses that cost over $300, at which they had eaten many times and had negative comments. They didn’t want California Rolls, they had an interest in traditional Edomae sushi. Perhaps they were a Michelin secret eater. If so, that’s perfectly fine. You can find sushi delicious even if you don’t have the knowledge. But with each learning experience you will enjoy the sushi even more. I hope it helps in improving your experience, even if it’s just a little bit. 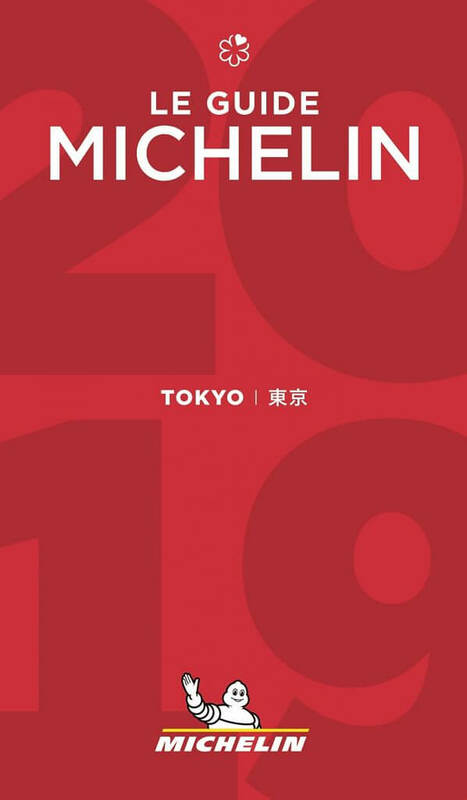 Posted on March 12, 2019 Categories About usTags culinary tour, food tour, Michelin, Michelin stars, Sushi History, Sushibar information, sushiuniversityLeave a comment on A Michelin Guide secret eater from the US?! What is the difference between Bafun uni and Ezobafun uni? While they are very similar to Green sea urchins (Bafun uni), Short-spined sea urchins (Ezobafun uni) are a size larger and have thick spines. Green sea urchins are 5cm in diameter and Short-spined sea urchins are 10cm in diameter. Green sea urchins are distributed from the southern areas of Hokkaido down to Kyushu. Short-spined sea urchins are mainly distributed in the Hokkaido and Tohoku areas. The most commonly eaten green sea urchins that are Short-spined sea urchins in Japan. Posted on October 15, 2018 November 13, 2018 Categories Basic KnowledgeTags Edomaesushi, Nigiri sushi, Sushi Ingredients, sushi toppings, sushiuniversityLeave a comment on What is the difference between Bafun uni and Ezobafun uni? The reply from the reservation system is based on the application by the guests autocratically. The original information of your reservation cannot be updated by our system. If there is a change, the new information will not be reflected in the following 4 automatic reply mails. What is the difference between “鮨,” “鮓” and “寿司” (all ready “Sushi”). Most Japanese people don’t know the answer to this question. As far as I know, there are three ways “sushi” is written on sushi restaurant curtains in Japanese kanji characters: 鮨, 鮓 and 寿司. Do you know the difference? Broadly, in the Kanto area 鮨 is generally used while 鮓 is more common in Kansai. 寿司 is used commonly everywhere in Japan. However, of the three, only 鮨 and 鮓 are seen in ancient Chinese literature. 鮨 was seen as a dictionary entry as early as the 5th to 3rd centuries B.C., and it’s origin is described as combining “fish” and “shiokara” (briny flavor) resulting in the term 鮨. On the other hand, in A.D. 1st to 2nd century dictionaries, “鮓” appeared, and is explained to depict “a storage container for fish.” Toward the end of the second century 鮓 was used for the term “narezushi”. But around the third century, the briny meaning of 鮨 and the term “narezushi*” written as 鮓 started to be used interchangeably. That is how the words were imported to Japan. In Japan, the character “鮓” was often used in literature from the end of the Heian era to the end of the Edo era. Eventually the use of “鮨” was revived during the Meiji era (for unknown reasons). It was a natural transition that Kanto came to use “鮨” and Kansai came to use “鮓”. Incidentally, the kanji “寿司” was created from the phonetics. Its use for celebratory occasions became commonplace throughout Japan. *”Narezushi” is the primitive version of Japanese sushi. It means covering seafood with salt and then soaking in rice for a few years as a form of lactic acid fermentation, which brings out the acidity. Posted on September 24, 2018 November 13, 2018 Categories TriviaTags Edomaesushi, Nigiri sushi, Sushi History, sushiuniversityLeave a comment on What is the difference between “鮨,” “鮓” and “寿司” (all ready “Sushi”). Most Japanese people don’t know the answer to this question. Assessing Fish at the fish market! One important task of sushi chefs is going to Tsukiji every morning, looking at fish with their own eyes and assessing the quality. Having a good eye is important in order to get the highest quality possible, but this is cultivated by experience. They are also constantly obtaining information from the fishmongers at the market regarding what the best fish of the season and their localities. It’s almost a game as to whether they can get high-quality fish at the optimum price everyday. The skills of a sushi chef start with this assessment. Posted on September 11, 2018 November 13, 2018 Categories EdomaesushiTags Edomae Shigoto, Edomaesushi, Nigiri sushi, sushiuniversityLeave a comment on Assessing Fish at the fish market! Why do most sushi restaurants have 8 seats at the counter? At sushi restaurants, only the master chef makes the sushi. Depending on the shop, the apprentices don’t even touch the knives. The texture of a fish changes greatly with the way a fish is cut, drastically affecting the workmanship of the sushi. There is a clear difference in taste when the master makes a piece of sushi from when the apprentice does. It is also commonly thought that a sushi chef can only take care of about 8 customers at once while he is also preparing pieces of sushi, so most counters have around 8 seats. Posted on August 6, 2018 November 13, 2018 Categories TriviaTags Baisc knowledge, Edomaesushi, Nigiri sushi, sushiuniversityLeave a comment on Why do most sushi restaurants have 8 seats at the counter? Foods made to go well with alcohol like ‘shiokara’ salted fish parts or dried mullet roe, don’t go well with shari (vinegar rice). Also, restaurants mainly serving alcohol and foods to pair with it are either bars or Japanese cuisine restaurants that may also serve sushi, but not Edo-style sushi. Many years ago sushi chefs would even get angry saying things like, “Sushi restaurants are not bars. If you want to drink, go next door!” Even Rosanjin wrote, “Sushi restaurants that served alcohol first appeared after WWII. Before the war sushi was served with tea.” In other words, Edo-style sushi restaurants originally didn’t serve alcohol. Perhaps it is true that the increase in sushi restaurants that feel like bars is a natural progression with time.